JUNO BEACH, Fla. —Kenneth Cornelius Coleman, 52, of Riviera Beach, was sentenced Thursday to 24 months in prison for unlawfully transporting endangered sea turtle eggs in violation of the Lacey Act back in 2013, an official report said. According to court documents, on July 3, 2013, sea turtle surveyors discovered disturbed sea turtle nests at 840 Ocean Drive in Juno Beach. Nearby, a trail of turtle eggs were found in the sand along with probing marks that were visible in the disturbed nests, the report said. Juno Beach police responded to the scene at Ocean Drive and found a wooden stick that appeared to have been used to probe the turtle nests, as well as three canvas bags. A blue bag was discovered and found to contain hundreds of sea turtle eggs. Analysis of the bag matched the DNA profile of Coleman. The sea turtle eggs were reburied in an attempt to allow them to continue to mature and to hatch. 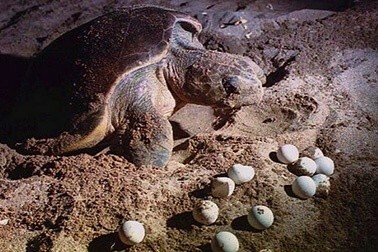 On July 4, 2013, additional sea turtle nests were found to have been disturbed and to be missing turtle eggs, including loggerhead and green sea turtle eggs, both endangered species. Near that location, Juno Beach police discovered a backpack which contained 97 sea turtle eggs. Coleman was later found on the beach near where the nests were disturbed. Officers detained him on suspicion of sea turtle egg poaching. Coleman spontaneously stated, “I don’t know nothing about no turtle eggs,” the report said. The retail black market value is estimated by the U.S. Fish and Wildlife Service to be between $3 and $5 per egg, for a total value between $948 and $1,580. U.S. Fish and Wildlife Service said Coleman was also arrested in 2010 for poaching sea turtle eggs, which are considered a delicacy and aphrodisiac by some cultures. He was also charged and pled guilty in 2010 for transporting endangered sea turtle eggs in violation of the Lacey Act. He was sentenced to 30 months in prison, according to the release.